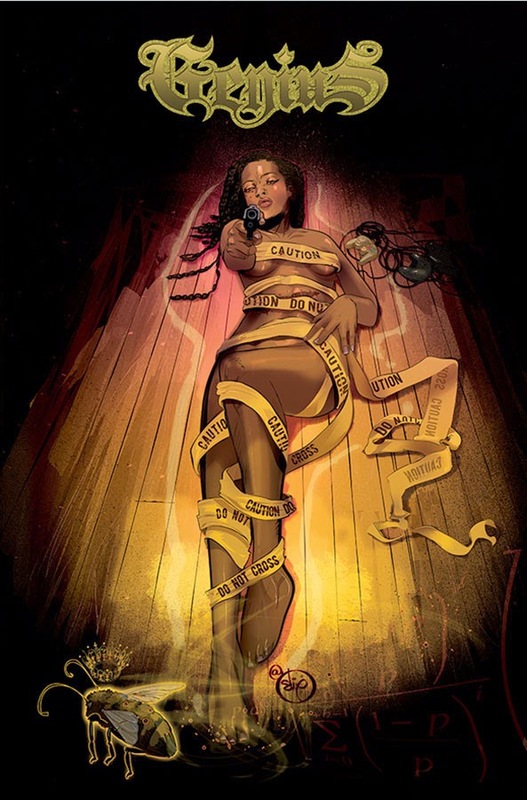 Writers Marc Bernardin and Adam Freeman (Alphas, X-Men Origins: Nightcrawler, The Authority, The Highwaymen) join forces with artist Afua Richardson for a contemporary, action-packed story in GENIUS. The first five issues of the series will be collected into trade paperback and available this May from Top Cow/Image Comics. GENIUS, VOL. 1, asks: what if the greatest military mind of our generation was born to a people who are already supremely conditioned to wage war, who know nothing but violence from birth and must continually adapt to new predators in order to survive? What if the second coming of Alexander the Great, of Genghis Khan, of Napoleon, of Patton… what if it was a teenaged girl from South Central, L.A. named Destiny? And what if she decides to secede three blocks of the ‘hood from the Union? Who is going to take it back from her and her army of gangbangers? Who CAN? This is the story of a city that declares war on a brilliant young woman pushed to the edge. GENIUS, VOL. 1 (ISBN: 978-1-63215-223-7) hits comic book stores on May 27 and bookstores on June 9, and will be available for $14.99. It can be ordered by retailers from Diamond Book Distributors with Diamond Code MAR150534.